Myriad stories are told in the Navajo pictorial weavings on display in the Influences: The Art of Navajo Pictorial Weavings exhibition at Mark Sublette Medicine Man Gallery in Santa Fe, New Mexico. 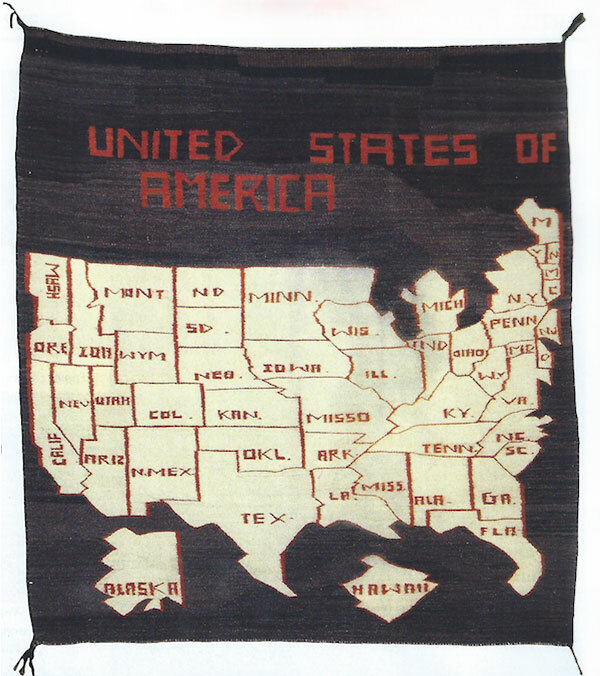 A circa 1960-70 USA map pictorial rug, possibly created for a school on the reservation, shows all 50 states, though there are loose interpretations of borders. 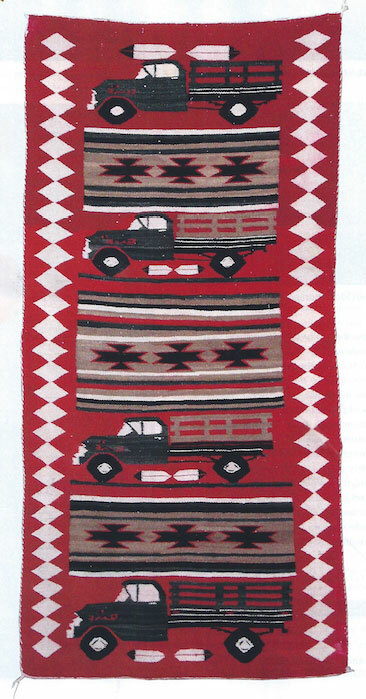 The circa 1950 truck pictorial runner renders GMC trucks from 1956, while a crystal quilt pattern horse pictorial rug heavily integrates the animals so important to Navajo culture. Navajo USA Map Pictorial Rug, ca. 1960-70, 50-1/2" x 49-1/2"
Gallery owner Dr. Mark Sublette explains a pictorial is any weaving, blanket or rug that deviates from a geometric layout to one that incorporates a figurative component. The exhibition running through September 15 includes about 20 weavings, and the collection explores pictorial imagery of Navajo weavings from the last hundred years, including examples inspired from trading posts, automobiles, animals and daily life of the Navajo. Collector Jeff Gartner from Tucson, Arizona, purchased one of is first weavings from Medicine Man Gallery more than10 years ago and one of his favorite pieces is a circa 1915-20 Navajo cornstalk pictorial weaving he obtained from the gallery in 1012. The hand-spun weaving uses natural and aniline dyes and is significant for its subject, as corn is a sacred plant used in many Navajo ceremonies. The weaving was originally collected by a couple who lived in Arizona in the early 1920s, and those who purchase pieces from the gallery will similarly learn the rich histories of the works, a most of the gallery’s weavings come from families who originally collected the pieces. 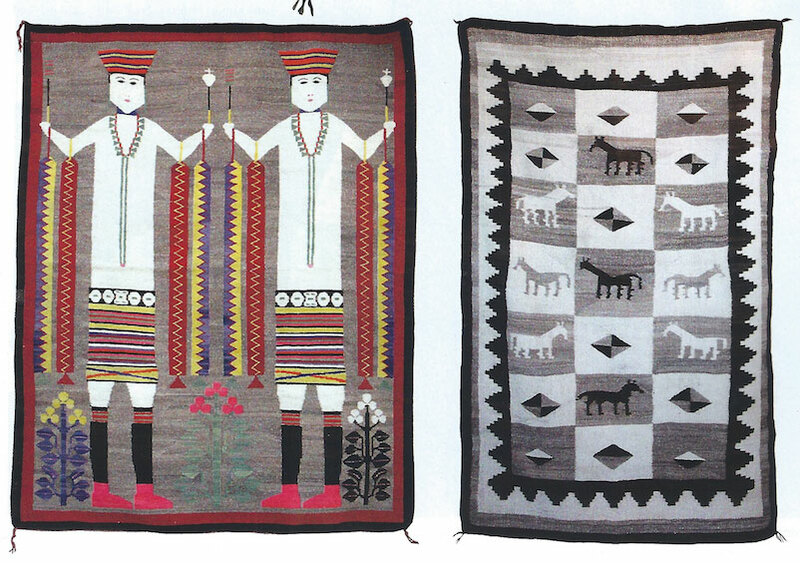 Left: Navajo Two-Figure Pictorial Rug, ca. 1920, 65-1/2" x 52"
Right: Navajo Crystal Quilt Pattern Horse Pictorial Rug, ca. 1900, 73" x 44"
“Mark Sublette is very knowledgeable about Navajo weaving and is always willing to spend time sharing his insight about the details of a weaving,” says Gartner. Another collector, Pete Herfurth, has purchased several weavings from the gallery and has about 230 in his entire collection. A third-phase chief’s blanket he bought from the gallery was recently displayed in a Minneapolis Institute of Art exhibition, and the constant influx of high-quality material into the gallery makes Sublette one of Herfurth’s go-to weavings brokers. “Mark is knowledgeable, he’s a good guy and he ha lots of material” says Herfurth, based in Wayzata, Minnesota. Navajo Truck Pictorial Runner, ca. 1950, 72" x 35"
Another example Sublette is exhibiting is a pictorial showing the lunar landing in 1969. Sublette says he always strives to have Navajo pictorial weavings on hand, since the genre is a passion of his.